As the season demands, I’m all set to make a fruit cake. Fruit cakes are quite rich with lots of dried fruits and nuts. Unfortunately fruit cakes are looked upon with disdain. So here I’m trying to uplift the image of our poor fruit cake with some changes in ingredients and how it’s made. The tradition of “boozing” the fruits started only a week before. In my cake the fruits & nuts are limited to dark and light raisins, candied peel, dates and cashew nuts as I’m not very keen on using umpteen ingredients. ( read no green and red thingies ) I used dark rum; brandy can also be used, as it’s always available at home. 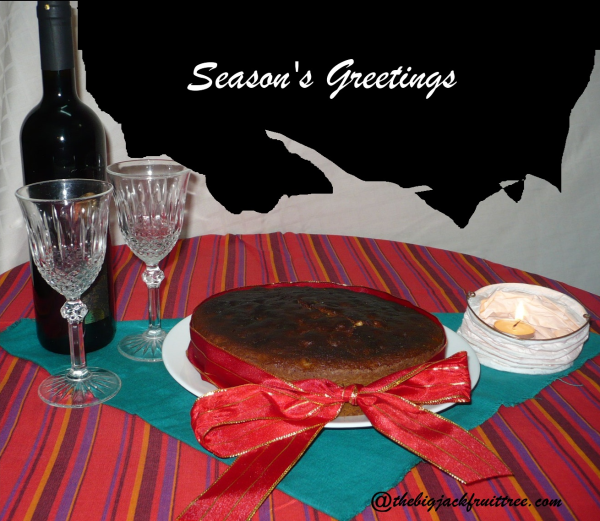 The Christmas fruit cakes are characterised by their dark colour and dense texture and the aroma of the spices added. Cinnamon is my favourite among them. The dark colour is attained by using caramel syrup which can be made at home. As I prefer a lighter texture for the cake I always separate the egg yolks and whites and add the beaten egg whites at the final stages of mixing the batter. A sprinkling of a couple of tablespoons of rum when the cake is still hot keeps it moist. Deseed the dates and mince all the above ingredients. Add rum to the minced fruits and shake them every day. Soaking of fruits can be done a week ahead of baking. Heat the sugar in a dry pan till it caramelises. Care should be taken not to burn it, otherwise the caramel syrup will become bitter. Once the sugar attains that dark colour slowly pour the warm water and heat it again till all the solid particles get dissolved, if there are any. Keep it aside to cool. Caramel syrup can be made ahead of time. Powder the whole spices with sugar and mix with the cinnamon powder. Preheat the oven to 180 degree Celsius / 350 degree Fahrenheit. Butter and flour a 10 inch round, 3 inch deep cake tin. Sift the flour with baking powder and baking soda twice. Cream the butter till creamy. Powder the sugar and mix with the creamed butter. A handheld electric mixer or a whisk will do the job. Once the butter and sugar are blended, egg yolks can be added one at a time and beat well. Add vanilla essence, spice powder and caramel syrup at this point and whisk again. Add the sifted flour mixture in 3 batches and whisk in between to get a uniform mixture without any lumps. If the consistency of the batter is too thick 2 tablespoons of rum can be added in between. Add the soaked fruits, powdered cashew nuts and 2 tablespoons of rum (if it’s not added already) to the batter and mix well. Now beat the egg whites to soft peaks and fold into the cake mixture. 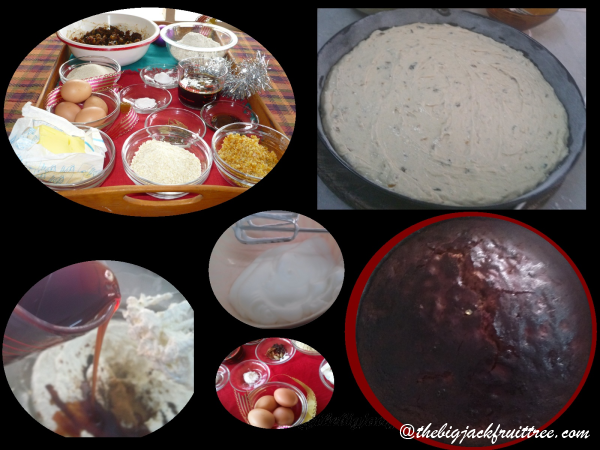 Transfer the batter into the prepared cake tin and bake for 45 – 50 minutes or till a skewer inserted comes out clean. Once the cake is out of the oven let it cool on a wire rack. After 5 minutes sprinkle the remaining 2 tablespoons of rum over the cake and let it cool completely. Now loosen the sides of the cake from the pan and invert onto a plate. Very thorough and interesting. Should try when I find a lot of time. Thanks, Lakshmi.It’s not as time consuming as it looks. Let me know the end result when you try. The cake looks so yummy! Love the processing pics too!